Jefferson is a truly balanced economic community - the site of industry, agriculture and small business owners. 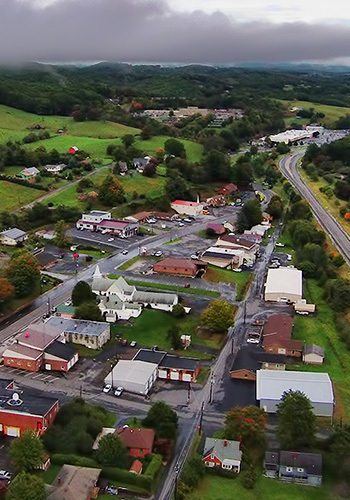 Entrepreneurs, legal, medical and educational professionals as well public servants work collectively in providing goods and services which benefit the Ashe county community and communities worldwide. Jefferson is the home of a major ambulance manufacturer (AEV) which provides medical vehicles for the U.S. and more than 50 countries throughout the world. The Gates Corporation manufactures hoses for the American automobile industry while preparing for the production of new, energy efficient green products. Another important inclusion to Jefferson’s diversified economy is McFarland & Company, Publishers. This award-winning company produces nearly 400 titles each year, all scholarly works in the fields of cultural arts, sports and military history. Established in 1979, McFarland and Company distributes their titles to libraries, scholars, entusiasts and collectors throughout the world. Ashe Memorial Hospital, recently selected as the nation's best rural hospital, is Jefferson's single-largest employer. The hospital has recently opened the Mountain Family Care Center, providing medical services for the uninsured. It also offers immediate services for minor injuries and illnesses. The Ashe County Free Medical Clinic is an additional medical service for those in financial need. Ashe Services for Aging, Margate Health and Rehabilitation Center and Segraves Nursing Home are major employers in elder care. Dotting the landscape in the Jefferson area are Christmas Tree Farms, a multimillion dollar industry for Ashe County. The county is the largest grower of Christmas trees in North Carolina and one of the largest in the United States. Jefferson proudly waves the banner for this all-important industry, as we have sent several trees to the nation's capital, having a place of honor as the “National Tree” in the White House. Retailers, restaurateurs and niche businesses are scattered throughout our community, reflecting an entrepreneur spirit not far removed from our agrarian ancestors. Search the Ashe County Chamber of Commerce website for additional information on the Jefferson business community.